Stay abreast of the latest sales, discounts, news, product releases, projects, and guides here on our blog. With the huge popularity of Justin Ma and Jie Tian’s translation for Gao Ying’s military manual, there has come a demand for a ring designed based on the book’s descriptions and drawings. We just had to take up the challenge! The result we think has good fidelity to the original, and offers a great shooting experience. I would describe this as an intermediate level ring. On the one hand, the “two prong guard” can encourage over-gripping and excessive retained tension in the thumb, both basic form faults. On the other hand the large load bearing surfaces on the sides and the relief for the thumb’s tendon provide excellent comfort. Despite the aggressive release angle though, the ring is exceptionally docile and easy to manage. It is definitely one of our all-time favorites! Love our ring designs, but want something with a little more spice? Well our custom ring decoration is exactly that! We currently offer two standard metallic coatings, bronze and copper, which look a lot like media blasted metal. It makes for beautiful rings, and you can leave it at that, but we also offer carving. This carving is available only on our coated polymer rings, and as you can see above is very dramatic. We offer two standard styles, weave and paisley. For teams, vendors, groups, etc we can also offer a high level of customization in an exclusive production run of rings. This includes custom carvings, as well as custom colors. Want electric blue rings with a team logo on the inside of the thumb pad or on the band? We can do that. Message us to inquire! Just a few of the different coatings we can offer in custom production runs. Seen at center is a real favorite of ours which changes color depending on what angle it is viewed. 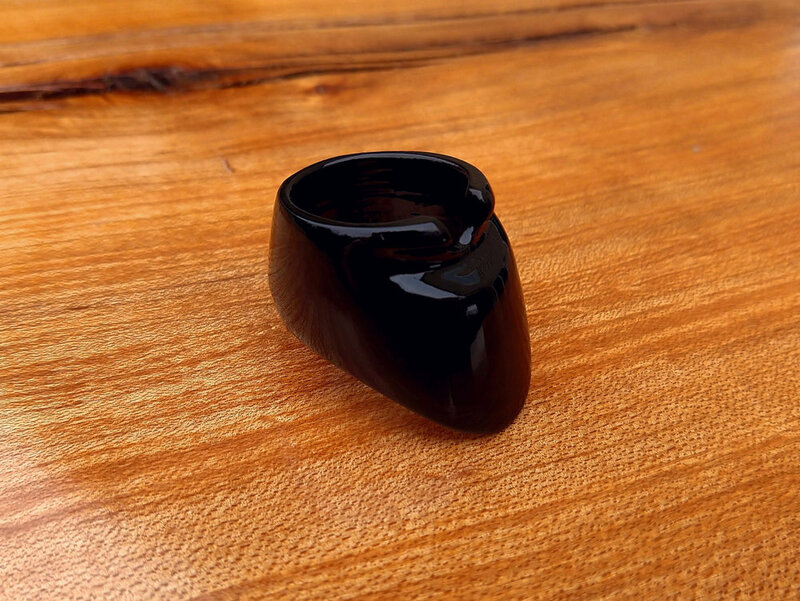 Our tapered leather inserts for the Korean Male style thumb ring. You asked, we listened. 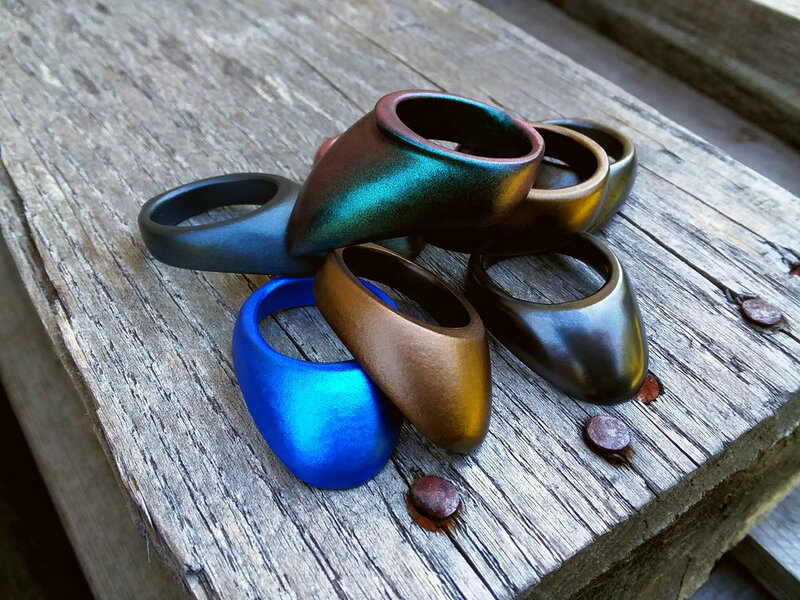 We now have leather inserts for the Korean Male ring. Get them while they’re hot! A recombination of our tongue and chinese spur rings in solid copper. We do, on occasion, get requests for fully bespoke ring designs.The challenge of such things is the initial design and development work, once that is complete we can manufacture a virtually unlimited number of that ring in any size or applicable material. This ring was borne of just such a request: the combination of our short tongue with our spur ring, to be manufactured in solid mirror polish copper. And, if I do say so myself, I think it came out absolutely beautifully. Fresh off the polisher, it has that perfectly light pink look of raw copper, not yet darkened by oxidation. The world’s largest thumb ring, shown here in our Mughal style. For size comparison is one of our Ottoman rings with our copper coating. Not satisfied with simply having the broadest selection of historical thumb ring designs available, we also wanted the biggest. And here it is, the largest archer’s thumb ring ever made. (to our knowledge) At over 30 centimeters long, this ring is about ten times the size of a ring you’d typically order/wear. If you wanted to draw a very large bow with your leg, instead of your thumb, it’d be about the right size to go around your thigh. What was the point of this? Absolutely none. But it was fun, funny, and get out there and shoot! Due to the American holiday, we'll all be out of the office from 9.1.18-9.3.18. All orders will be filled/inquiries responded to as normal when service resumes 9.4.18. As a thank you we're offer a 15% discount for those who use this discount code (CM8SMHV) while we're on holiday. This discount applies only to orders placed on the above dates, and is not retroactively applicable. Our latest design, the Mughal Ring. Swooping curves all around, but for a break at the back, this design allows for a broad range of string positioning depending on the shooter's tastes along with a fast clean release. Whether it is because you love the style, or want the fully rounded form for individual string placement, this really is one to try. A beautiful and fully functional katana with differentially hardened blade, ray skin handles, tight wrapping, and lacquered saya. 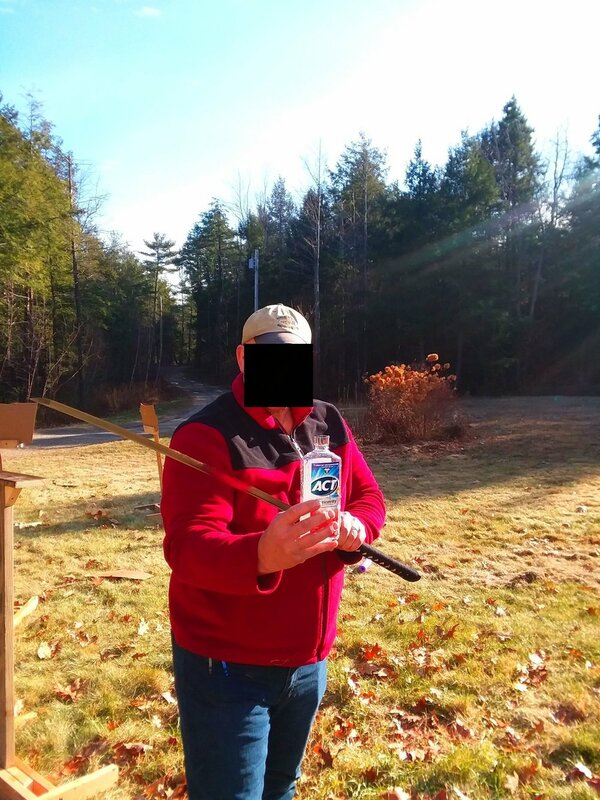 Those of us with an affinity for historical archery tend to share a broader love of historical weaponry. Be that armour, shields, black powder firearms, spears, or swords. This story begins when one of us was browsing available swords and discovered that a fully functional through-hardened katana could be had for a mere 50$, deferentially hardened (real hamon) with ray skin handles and other flourishes for 100$, and folded "damascus" for 200$. Clearly, this newfound information needed to be put to work. 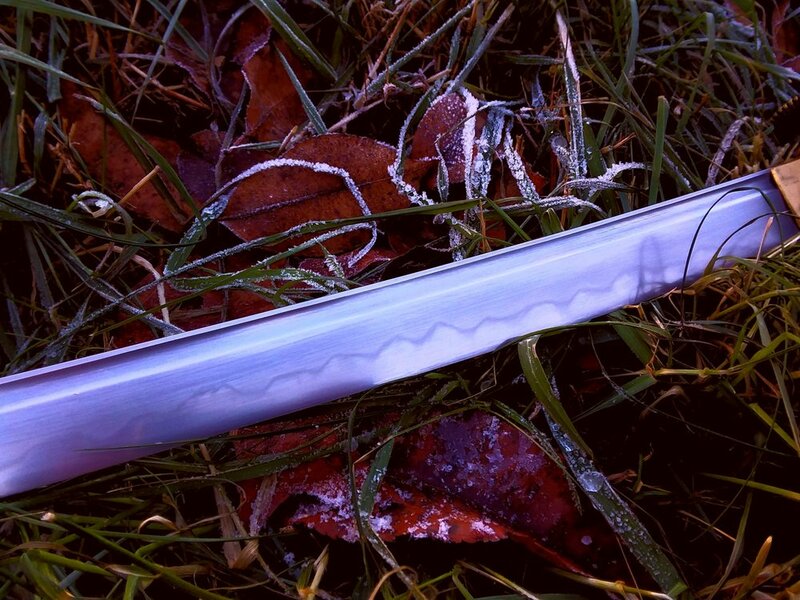 Showing off the differential hardening aka hamon, would you believe this blade was only 100$? Test cutting is fun, and I suspect common practice among those who've bought a functional sword, but you can only hack so many water bottles or expensive tatami mats before it becomes cost-prohibitive and, dare I say it, boring. 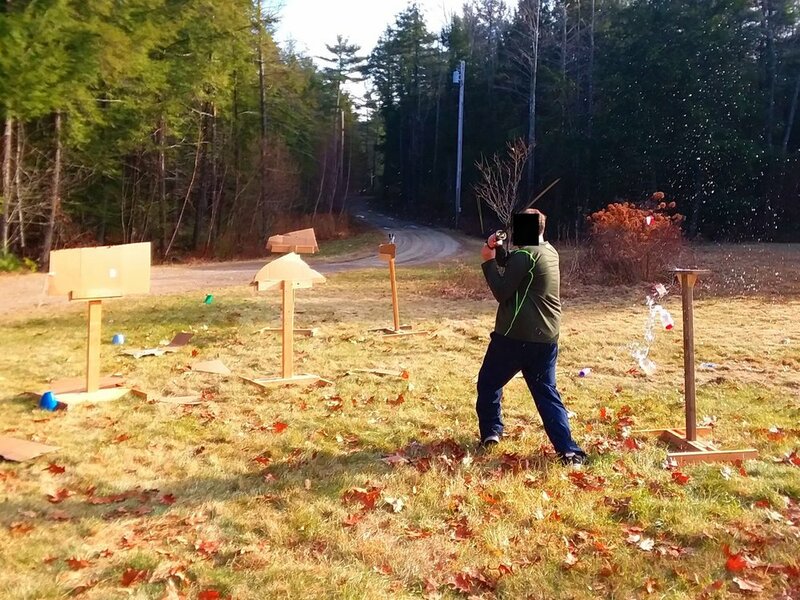 I liken it to target shooting in any variety of disciplines, sure you can spend endless hours refining form and fighting for those slim gains in precision, but eventually you want to spice things up with novel scenarios, targets, action, and competition. The answer came from the background some of us have in competitive pistol shooting. Borrowing elements of the target stands and overall competition setup, we set to work. 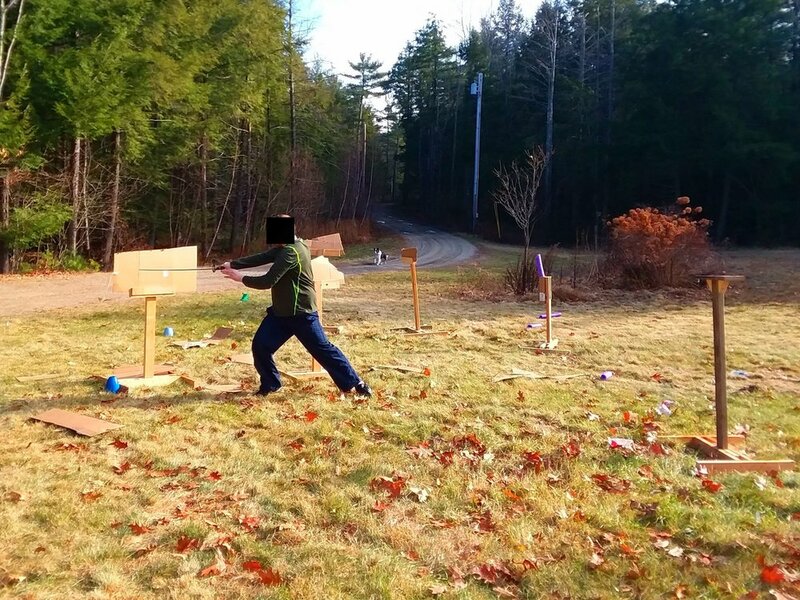 A sword obviously has a lot more momentum than a 9mm pistol round, so instead of strapping we opted for a single 2x4 as the upright in the center of a four foot long segment. The method of assembly is simple. Cut four pieces each two feet long, add two ends, and a loose vertical in between them and dry fit. When you're happy with the fit, a cordless impact, screw gun, or your screw driving weapon of choice can quickly and easily zip the whole assembly together with two exterior grade deck screws per join. The vertical in the center can then be withdrawn leaving a modular "foot" that can accept any sort of target which can be mounted atop a segment of 2x4. With two people working, a dozen of these can be knocked out in an evening for perhaps 20$ or less. From there we need to build targets themselves. These days cardboard is perpetually coming and going from online orders and so on, it seems in endless supply and we recycle it by the truckload. Breaking it all down is a time consuming process, so lets put it to work. After all, shredding is part of the cardboard recycling process, what harm will a little extra breaking-down do? So we zipped together some clamp stands which use two boards in a T shape and a few screws to clamp a sheet of cardboard. With a cordless impact, zipping these open and closed to swap cardboard sheets takes a few seconds. Wanting some variety though, we also decided to make a pool-noodle stand, a cutting target more akin to a tatami mat while costing vastly less, but surprisingly challenging to defeat. And, finally, we created a platform stand where free standing objects, namely water bottles, could be placed for cutting. Understand this was all zipped together in the span of an evening with scrap material we had laying around, thus it represents just a fraction of the possible diversity of targets. What about a linked-stage for example, where the cutting of one target would release another target held on the end of a string which would begin swinging? A rolling ball target like in Bladesports? Or how about a free hanging rope? Or what about a combined stage where one starts with a bow or spear and then transitions to sword? The possibilities are truly endless. If you look closely, you can see both pieces of the cut Gatorade® bottle still in the air. It is worth noting at this point that swords are weapons and, like all weapons, are incredibly dangerous. Safe use and handling practices should be observed, and everyone who is not cutting should keep a reasonable distance and remain in a safe direction. This all should be fairly obvious, but a few sentences are cheap while injuries incredibly costly, so it bears mentioning. Less obvious is the importance of "real swords." Many of the cheap, often "stainless steel" swords out there are not suitable for cutting. This is less because of poor grinds or edge retention, and more due to fragility; should a piece of a sword blade part company from the remainder of the blade or handle, an extremely dangerous event has occurred. A perfectly, precisely, decapitated mouthwash bottle. If you have one of these bottles laying around, look at how thick the plastic is at the mouth where it was cut. We were all amazed. The bottle was cut and left standing so perfectly, initially it was thought to be a miss. How to score, how does it work, and what is it like? Smartphones being ubiquitous, someone pulls up a stopwatch app, and times as the person makes their way through the course. A completed cut adds no time. Each partial cut or uncut target adds to the person's time. At the end the lowest time wins. This is entertaining for hours on end as friends compete and new clever and challenging scenarios are set up. Cardboard silhouettes provide great sport, but errors in blade alignment become readily apparent.